At first glance you might be forgiven for thinking, rat? Mouse? But then you look at the tail…. 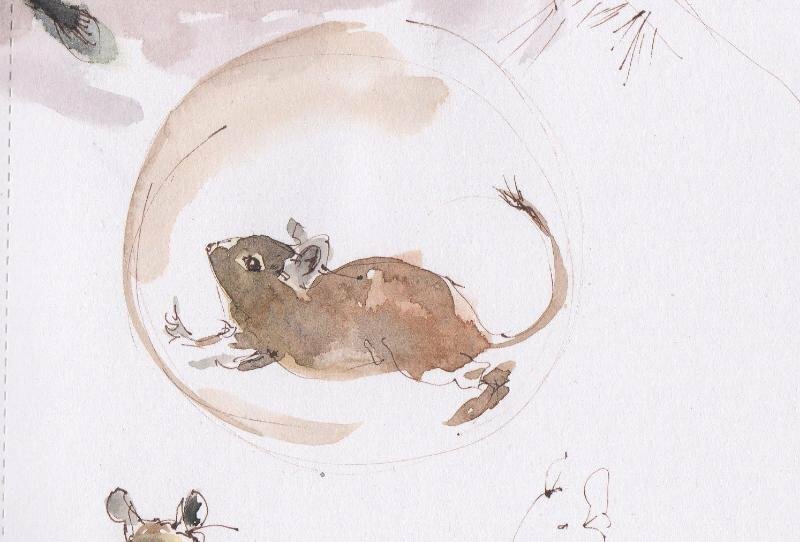 and you say to yourself, hmm, dormouse? But the size rules that out (it’s bigger than a hamster) and you realise you’re looking at something entirely different from all of these. 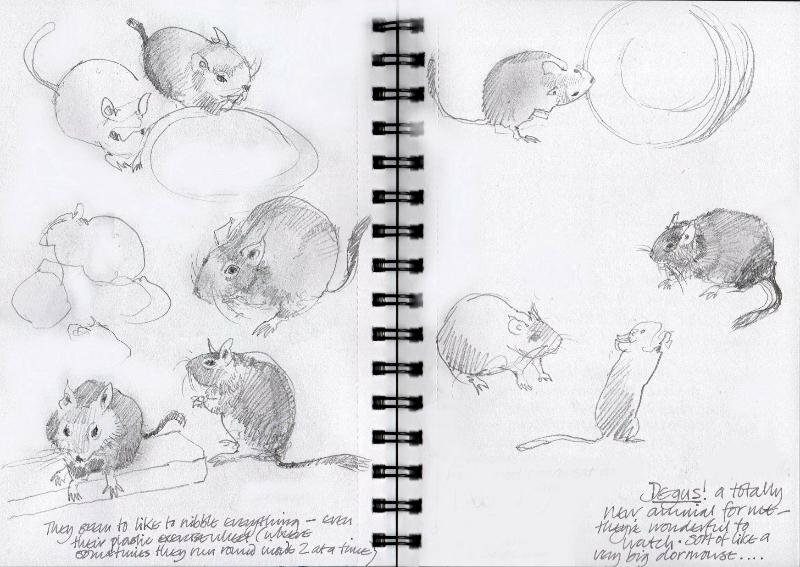 The first time I sketched them about a fortnight ago in their new home at Cliffe Castle all these thoughts were going through my head and I admit I was confused. In fact as I looked at their little rounded bottoms I kept thinking of guinea pigs, and just once in a while I’d suddenly see something in the eyes or the shape of a nose that made me think rabbit (though that immediately seemed ridiculous) so I kept on looking and drawing, although for a long while all my sketches looked either rat-like or guinea-pig-like – until I felt I knew what I was looking at. 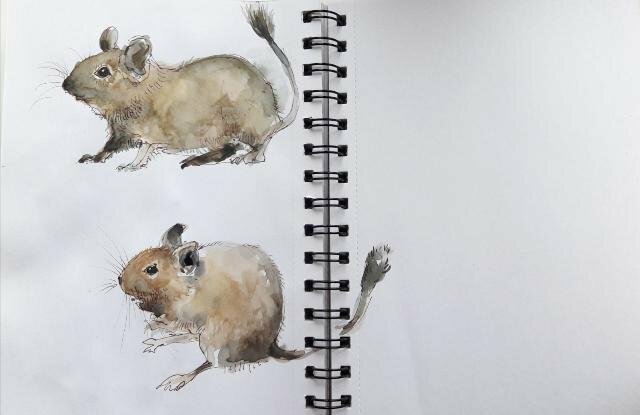 Degus. Very special little animals. – which meant that when I went back again to the animal houses a couple of days ago I had a better idea of what I’d be looking at. (I also learnt that they’re related to guinea-pigs and chinchillas and come from the high Andes, are active during the day but don’t like hotter temperatures, that they’re highly social, and that they live longer and are more intelligent than their near relatives). Interesting facts – but I can learn a lot by watching. 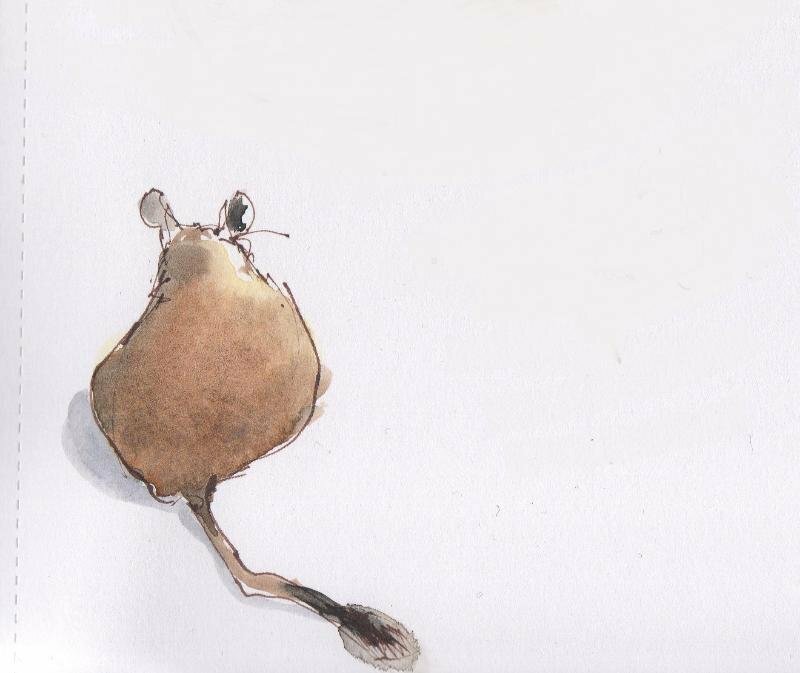 So I stand with my nose pressed up against the wire, sketchbook and pen ready, and wait. It’s a warm afternoon, and because of that they’re all inside their custom-built house which has two floors, several entrances and exits and lots of hay for bedding. I can imagine them inside all in a heap, snuggled together. 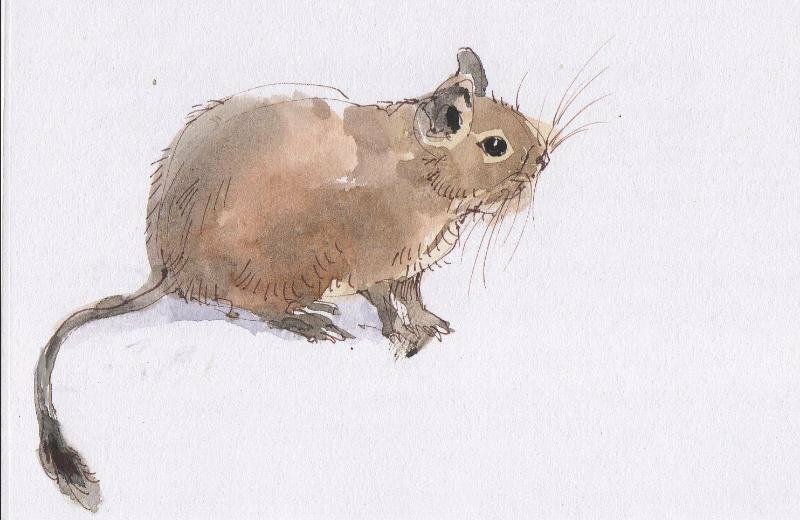 (What’s the collective term for degus, I wonder?) I can just see a couple of noses, two pairs of beady eyes. They’re awake and watching me. I don’t know if it’s getting cooler or whether they’re just curious, but one by one they start to come out of their house, sniff the air, look around. One or two of them do look at me, one from a lookout position at the top of the plank that leads to their second storey entrance, one perching on the edge of a large empty red bowl. I can see how their tails help them balance. I can see tiny toes, (I know there are five) and ears like crumpled petals. Pretty soon one of them ambles slowly over to the green plastic exercise wheel, climbs in and gives it a whirl. 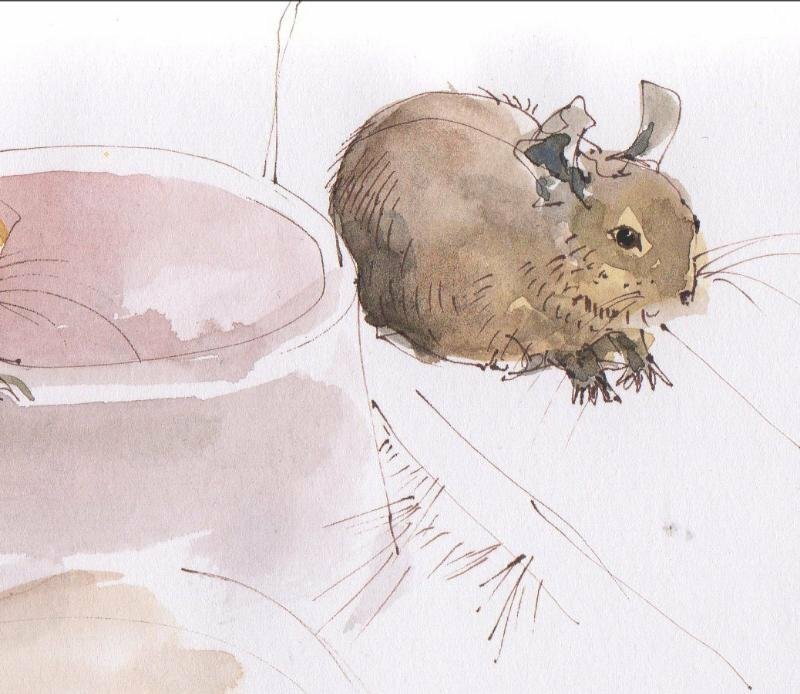 I wonder whether I’ll be able to draw those flying feet and have serious doubts, but I give it a go anyway….. and there’s no squabbling when a second degu arrives and also wants a turn. They fit amiably side by side and go racing round together in perfect unison. I can’t draw that. 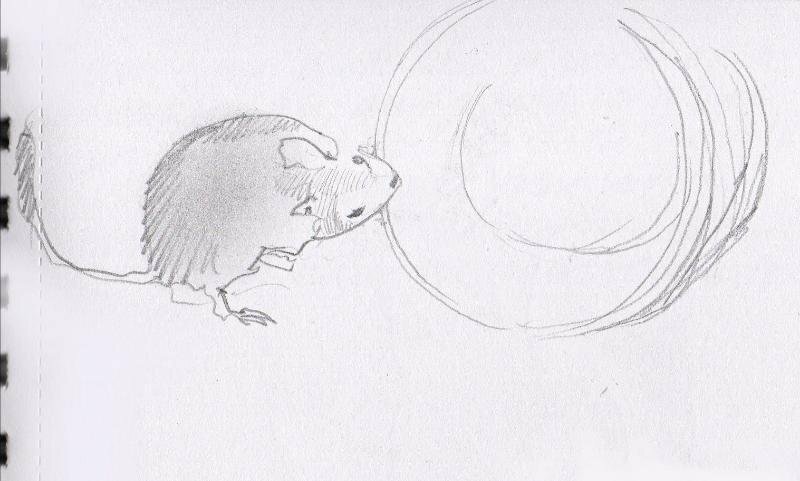 The plastic wheel is also very good for gnawing…. By now I’m beginning to feel I’ve started to get to know them, and the more I watch the more I want to touch and stroke those little rounded backs, feel the sleekness of fur, and if possible very, very gently touch a fragile ear with the tip of my finger. I can’t do that, but drawing almost does it for me; my hand may be holding a pen and touching paper, but my mind is feeling fur, whiskers, skin.